Since yesterday our temperatures have soared and we have gone from jackets and socks to shorts and bare feet… now that feels good! The oriental poppies will now gradually take the stage and the new lavender buds are such a gorgeous lime green. The Centranthus are also opening, and the bees and butterflies are already in the queue! The peony at the top, above the Euonymous, will be a white one, and it smells lovely right next to the patio. This iris must have been dormant for at least 8 years, waiting for the right conditions to flower again. The place it stands was originally a stream – long gone – but I had noticed the leaves before. It must be some kind of water iris. This year’s mild winter and pleasantly damp spring encouraged it to flower. I bet it won’t like the heat this week though! Have you ever had a plant suddenly pop up like that? Wow! that Iris was a lovely surprise, it’s beautiful. Will you try to move it to somewhere you think it will flower better ever year? You are having more sun than me this week. I won’t move it Christina, as I don’t have a damper spot to put it… It will surprise me again one year I’m sure! I had a neighbor who discovered a Himalayan Blue Poppy in her yard. I don’t know if you know how rare those are. Some special bird delivered the seed no doubt. Many of the blue species of flowers are rare–wonder why that is? Harder to get pure colors? I know I adore blue flowers, they are my favorite. Right now I have a huge vase of bearded iris in four shades of Delft blue, Cerulean Blue, Ice Blue, with deep purple and white. I’m in heaven! 😀 How lovely – yes blue flowers, especially in summer, are quite precious. Those irises sound wonderful Susan. My Veronica is starting to flower now… lovely tall spears of tiny pure blue flowers. Beautiful blue sky again and your garden is progressing beyond spring now. Love the red poppy. 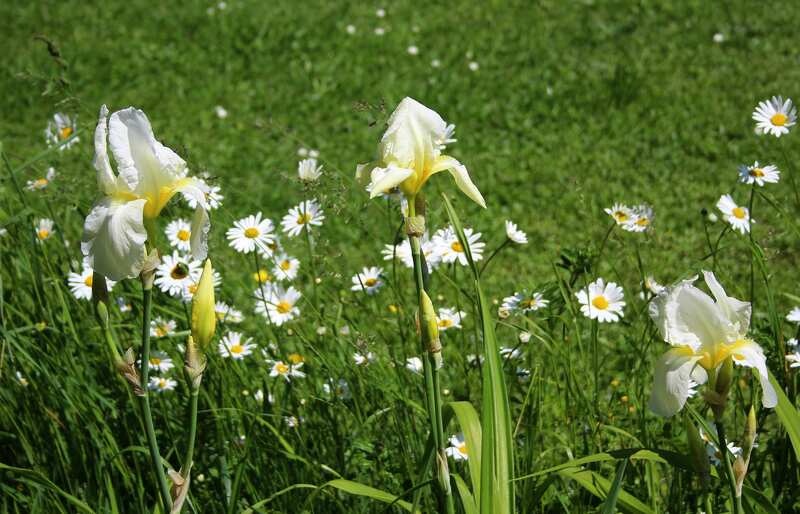 That is a gorgeous scene of the irises and daisies–what a nice surprise to have it bloom. You’re right, it is starting to look like early summer, although still no roses flowering. I think the iris fits very well into the surrounding wild flowers and I am glad it decided to bloom this year! I love that deep blue sky as well as the Iris – so gorgeous mingled with the daisies. Very summery & uplifting. Lovely to see the red poppy against a blue sky. The irises would be a nice surprise… the only plants that seem to pop up here unexpectedly are weeds! We get plenty of them here too! LOL! In fact a new weed has appeared this year and I have left a couple standing to see what they are… vaguely familiar but can’t quite decide what it is until it flowers. Gorgeous view Cathy, I think I can see more, have you changed your photography spot. I am sad to say we have not had so many bees and butterflies as I thought would be in the garden yet, I am glad you have. 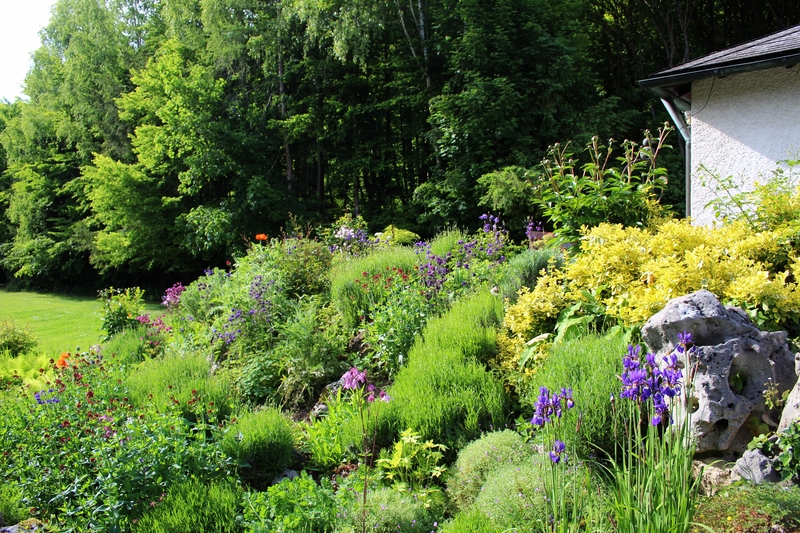 I think the shot is from the usual angle Julie, although I do change it slightly sometimes… I like to get in the lime green of the Japanese Maple at the very top, in front of the birches, as well as the rock in the foreground with the irises now flowering in front of it. I’m sure the bees and butterflies will appear soon… the Cotoneaster flowers have attracted a lot of bees this past week. I love your red poppy against the blue sky and what a lovely Iris. We have had lovely hot summery weather this week too. It is wonderful when all your summer flowers come out. Walking round the garden each day is so exciting as you get re- acquainted with all your favourites. I couldn’t agree more Chloris! It’s a great time of year for gardeners. This morning I saw my Nepeta is flowering and another poppy has opened! It was amost 30°C here yesterday – more on the patio – but we will enjoy it while it lasts! I noticed some cilantro that popped up from last year’s seeds. As I did not plant any (yet) this year, might have come from plants going to seed…as nature intended. Enjoy the lovely weather!!! That kind of surprise is also a nice one Lori. I have been hoping my borage would have reappeared by now as it sets seed usually. Hope you are getting some sunshine too – it’s glorious here! There were only three stems, and I cut one for a vase as they were suffering in our mini heatwave. Yes, I wonder if they will ever flower again…. we will see! Your iris is beautiful, it must have enjoyed all the rain over the winter! I think iris is a wonderful family, with one for every spot in the garden. Your sky is so blue behind the poppy! The sky really was that blue as we had lots of wind earlier in the week to blow away any cloud, but today is a little hazy and I wouldn’t be surprised if we get a thunderstorm. Flowers of all colors are obviously quite beautiful but for some reason those of white have a special appeal for me. The photo of the red poppy/green leaves backed by blue is stunning. Thank you Dohn. The water iris suffered in our heat today and I have now cut two of the three stems – they look so much happier in a vase of cool water! The poppies on the other hand are basking in this hot sunshine. The view is looking stunning Cathy, simply stunning! And I’m a bit jealous of your blue sky as although it’s been warm we’ve had a few greyer days on the coast – no torrential rain though!! With our unpredictable weather, we get sudden plant pops all the time. I love your irises and poppies! Your garden looks colorful, healthy, and happy. No fair! For as early a spring as you had, our season has nearly caught up! Here peonies are budded, aquilegia is blooming, and iris are starting…. A few hot days and spring has raced away from us and nearly turned into summer! Warm weather forecast for next week too, I almost feel like the roses here will beat yours! I love the emergence of all that blue in your slope border Cathy, but that iris is to die for, so delicate. Ive watched various bulbs and lots of acanthus Mollie shoot up in the back garden after we got rid of the conifers, and last year we had loads of beautiful poppies. Sadly, no sign of them this year, and I foolishly didn’t save seed because I assumed they would return under their own steam. Tha acanthus must have been a nice surprise! That’s a shame about the poppies. I’m trying to grow some this year but the snails are finding them rather tasty. I used to have loads of Sweet Williams which came up year after year, but this year there are hardly any… must spread the seed about a bit by hand I think. I’m running way behind in even getting to my computer, and scanning the Reader your beautiful photos showed up and pulled me right in. I love Oriental Poppies. For a long time they were popular “around here” and I am assuming that perhaps they have simply fallen a little out of fashion because of so many going to more drought tolerant landscapes. I’d almost forgotten about them. 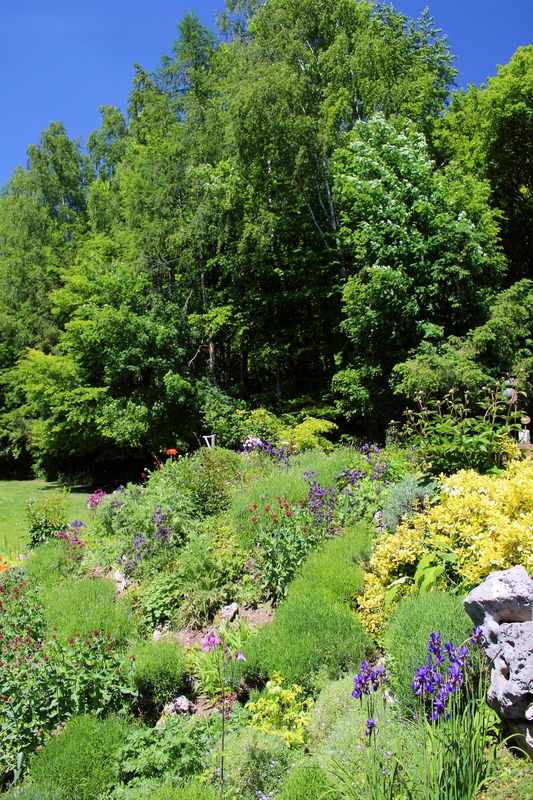 Your garden is so lovely and allows for so much diversity. And you must have been thrilled to see those Iris! Really lovely, Cathy. Thanks Debra. These poppies are quite special as they were the first plants I sowed and planted for my garden here! The rockery has grown up around them so I love it when they bloom. Hope your weekend was fun – have a great week! I don’t think I have ever had a plant wait that long to flower but 3 years now and bleeding heart are back. The irises are lovely – plants just take their own time to appear, I guess! A pleasant surprise! 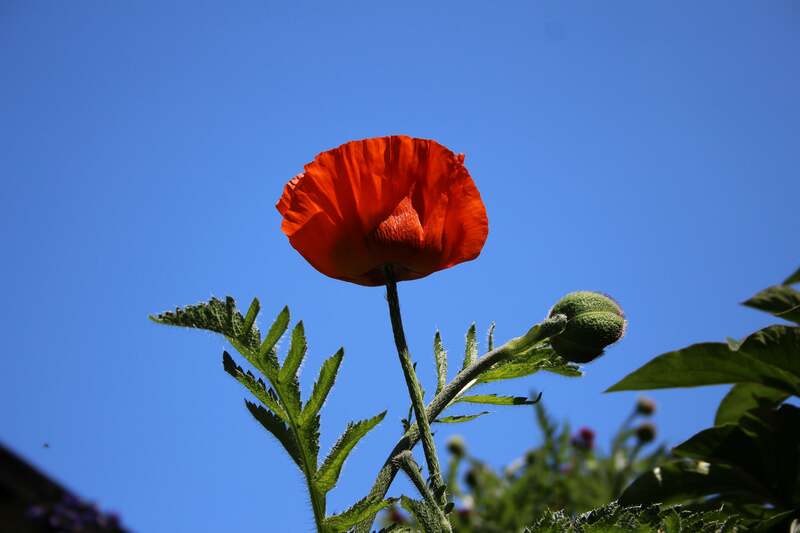 Really love the photo of the poppy against the blue sky – gorgeous! Thanks Sheryl. The poppies are looking loveler every day. Hope your weekend is good too!